It’s a terrible thing for an outstanding job to be met by a skeptical or disappointed client. Time devoted to managing client expectations before job completion can help avoid this fate. I often turn to this real world example to remind me what expert expectation management looks like. Maybe it can help you, too. I watched anxiously as the repair technician took apart my laptop. This machine, splayed across the dining room table, represented a hefty investment and was my main tool for work. Imagining that it was probably unpleasant to be watched so closely, I excused myself to the kitchen to grab a glass of water. When I returned to offer him something to drink, he was already done! Everything, every tiny little piece was put back together. 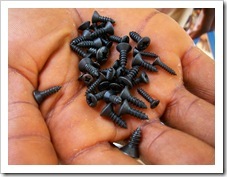 Before handing my laptop over, the technician pointed to a plastic bin filled with a variety of tiny little screws. He then went on to explain that when he was reassembling my laptop, one of the original screws was nowhere to be found. He replaced it with one of his own, from his plastic bin. Isn’t that brilliant? I’m pretty sure I would have been suspicious of the quality of his work had I found that missing screw without any word about it from him. My confidence would have been shaken enough that a response of “Don’t worry about it, I replaced it with one of my own” would not have eased my concern. This is only one aspect of expectation management, but it had a huge impact on my experience as a client. Because of this encounter, I am even more careful to manage my projects in such a way that my clients are not likely to run into an issue without knowing about it first. I hope the same is now true for you.